James Yates’ Well is a very scenic spot right at the top of Lead Mines Clough where Limestone Brook splits upstream of a wooden bridge and the last of the “proper” waterfalls. It’s easy to get to from several routes – either from the designated footpaths from Jepson’s Gate, or an Open Access tussock-hop. I prefer to use the unmarked path from the Wellington Bomber Memorial which skirts the top of the valley. James Yates was alive in 1821, when he was one of the members of the Rivington Male Friendly Sick and Burial Society. This old group had formed way back on 24th November, 1786, and James Yates was part of the later members who amended a set of old rules such as “Members coming into the Club Room may drink once and then retire”. I’ll add more about this society in due course. 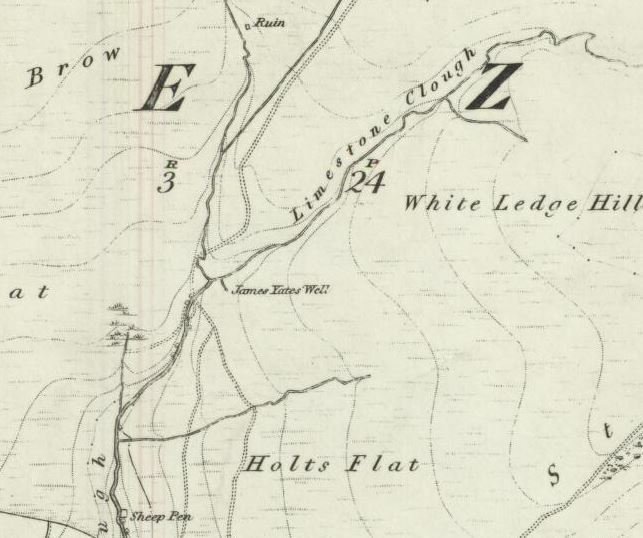 James Yates’ Well, as shown on the earliest OS maps. Note also the ruin at top centre! The ruin shown top centre of the map does not feature on any other mapping to my knowledge, and it is doubtful there is any further information on this dwelling. I have been to the spot, and even now over 150 years since the mapping, there is a small amount of evidence still present. I’ll have to go back to take some pictures, and when I do, I’ll be sure to edit this page. There was a newspaper report in the Chorley Standard on Saturday 22nd October 1864 in which Mr. Anderton (related to the Anderton Stone one wonders?) wrote an in-depth report. Note the reference to a James Yate, rather than Yates. The petrifying spring, James Yate’s Well, was formerly in great repute. Before railways were invented to carry people to Buxton and other places, the lame, the half and blind for scores of miles flocked to Anglezarke to drink and bathe in its, I believe justly celebrated waters. I sent a bottle to a medical friend of mine, studying at the Royal College of Surgeons, Dublin, in 1836, when it was analysed by the celebrated Dr. Apjohn, Professor of Chemistry at that place. Bicarbonate of Lime and Bicarbonate of Iron equal parts, waters and a great excess of carbonic acid. The water has a brackish taste, the temperature does not vary much from the water in the adjoining brook. I have sent you a piece of the moss petrified, with the upper part unpetrified, also a small amount of the solid sediment of the heap thrown up by the spring, which contains a great proportion of lime. Mr. Anderton adds, “I forgot to mention that there is a curiously-shaped bank in Rivington, called the “Street Ark”, supposed by some to be artificial. More on this in the future! In the above article, “petrifying” is a process where organic material becomes mineral, a fascinating fossilisation process on which you can read more about here. 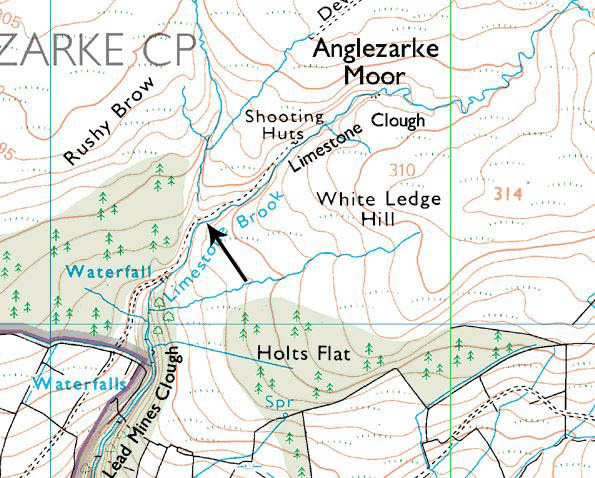 The water at James Yate’s clearly still has much peat in it, indeed this is what gives nearby Black Brook its name.